optionnal option for Gardner detector: 'b' for basic Gardner, 'u' for upgraded Gardner (insensible to DC offset). If not specified, the ugraded version is selected. 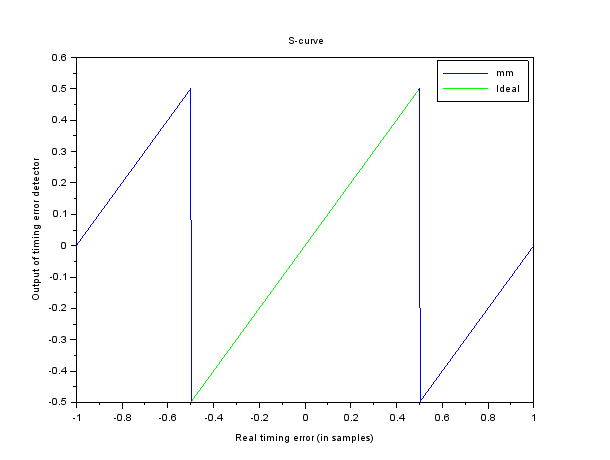 Compute with = received signal, and = estimated signal (here sign(r)). AGC et DC offset correction are necessarily done before. Needs only 1 sample / symbol. Early-late gate detector, with delay = 1/2 symbol.